This waterline model of Queen Mary is built in the tradition of what were called “Studio Models” in the middle decades of the 20th century. They were designed to attract potential North Atlantic travelers and displayed in the windows of upscale travel agencies. In the late 50s, air travel had advanced to the ability to fly from New York to Europe in 11 hours or so. Before this time, ocean liners were literally “The Only Way to Go.” The Queen Mary was made a dinosaur nearly overnight by advances in technology gained during World War II and only dreamed of at the time of her maiden voyage in 1936. Not only was it cheaper to fly, but reaching the opposite ends of the Atlantic in hours rather than days was very much embraced by the traveling public. The jets spelled the end for great liners like Queen Mary. 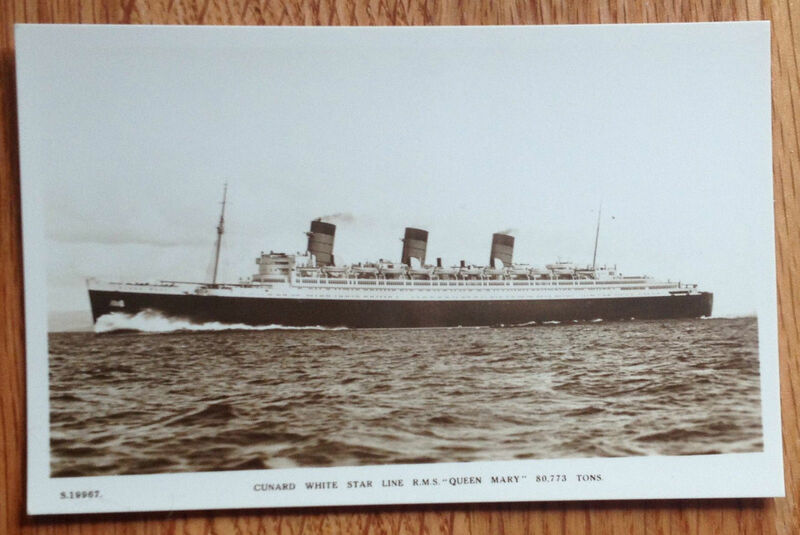 Cunard White Star tried to utilize her majesty as a cruise ship but she was so large, she couldn’t fit into the smaller ports. She was built for the North Atlantic to transport huge numbers of passengers at magnificent speed in unparalleled luxury. She was retired in 1967 and sailed on her last voyage to Long Beach, CA to be turned into a museum and hotel. Nearly 6 feet long, one can see in the photographs that the studio models were quite impressive. Mine was built by Ered Mathews and it is quite detailed and built using original building plans. The specially-built table it rests upon is 32 inches tall, 18 inches wide, and 72 inches long. My collection is taking up more and more room in my house and I hope to one day live in a large house with a room specifically built for Queen Mary memorabilia with this table and model in the center with ceiling floodlights shedding light upon it. I have a 10 year-old nephew who informed me upon seeing it that all he wants from my estate when I die is this model! The Queen Mary at a full gallop on her maiden voyage to New York in May of 1936. In this remarkable and rare postcard, the bow wave created by the liner’s charge at 32 knots was between 50 and 60 feet high. The Blue Riband was an international trophy awarded to the world’s fastest liner. France’s Normandie had captured the award a year earlier in 1935 but the Queen reclaimed it for England in August of 1936 by being the first ship to cross the Atlantic in less than 4 days. The two superliners both had 3 smokestacks and a cruiser stern but Normandie was considered chic and modern while Queen Mary was stately and regal. Many critics panned England for creating a liner with the lines reminiscent of an earlier era, only more mammoth. But Normandie always sailed with half of her passenger complement while Queen Mary was booked solid for nearly 2 years! Passengers absolutely flocked to her and she is, without doubt, the most successful liner of all time having served 6 years in World War II as a troop transport. She still holds the world’s record for the most passengers aboard a single ship: 16,863 GIs and crew in 1943. Painted drab grey and stripped of her luxurious furnishings, she earned the nickname Grey Ghost for her abrupt arrivals and departures when accommodating and delivering troops around the world. Her speed enabled her to outrun torpedoes yet she still zigzagged across the pond to deter a wolf pack of Nazi submarines that may have been waiting. She was delivering entire divisions to the war front at once and Hitler was furious. He offered a quarter of a million dollars and the Silver Cross to any U-boat commander who could sink her. After the war, she was commissioned to bring British war brides and their children to a new life in America. She resumed her peacetime career in July of 1947 and held the Blue Riband until the liner United States took it in 1952. After millions of miles traveled and millions of passengers transported, she was retired in 1967 due to the influence of jets that could fly across the Atlantic in hours rather than days. Too large and expensive to upkeep, she was sold to the city of Long Beach, California where she is permanently docked and serving as a hotel and tourist attraction.